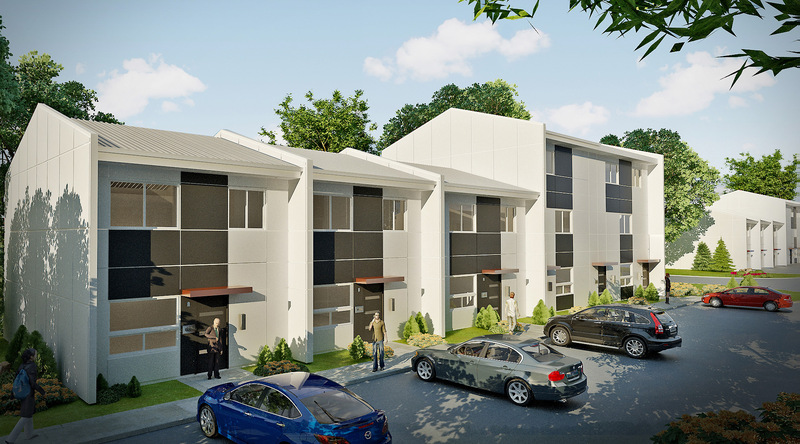 Responding to a proposal call from the City of Thompson for development of two parcels of vacant land across the street from each other, Calnitsky Associates Architects was successful in providing 24 affordable townhouse rental units funded through Manitoba Housing for this expanding northern city. Three and four bedroom visitable units, and well as three fully wheelchair accessible units were provided in five groups spread across the two lots. The townhouses step down along the sloping site and are demarcated by fin walls extending above the roofs providing individual identities for each home. Units front onto convenient parking and each have dedicated back yards or a balcony. The 2-storey townhouses are bookended by three 3-story over/under units to accommodate the double wide ground floor barrier free homes, adding interest to the massing and transitioning between adjacent apartment blocks to the south and single family homes beyond.